Cloe gets a new look! Re-invented with new finishes and new compositions, Cloe stands out for its versatility and unexpected combination of classic and modern elements. Vintage handles or ultra-modern grip profile handles find their place on base units and wall units. The presence of metal and Air open modules in minimalist style enhance its contemporary and bold character. In this composition, elegant white UV glossy lacquered base units and wall units blend with Atlanta register pore oak laminate, adding character to tall units, shelves and panels. The titanium aluminium handle adds distinct appeal to base units and tall units, expressing a spartan and slightly retro mood, further enhanced by the Factory bookcase with a titanium aluminium frame and Colorado register pore laminate shelves. 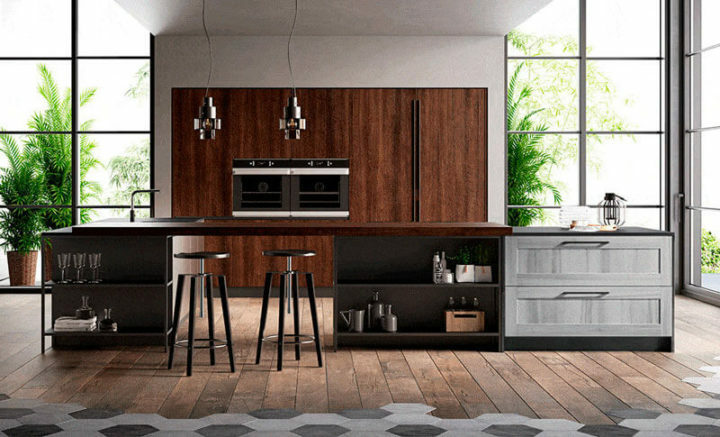 The contrast between the Colorado wood-effect frame of the base units and the matt UV orion grey lacquer of the wall units and tall units creates a warm/cold contrast, giving the kitchen distinct appeal. functions and design in a limited space.